Pibbs PS95-1 Anzio pedicure spa with shiatsu and heat massage. Pipe-free turbo jet system. The spa basin has a sleek european design done in Gunmetal Pear and Pearlescent White is made of Fiberglass-reinforced Acrylic. 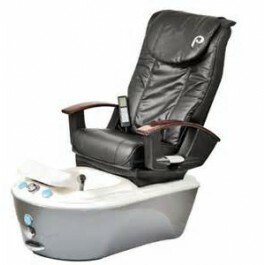 The shiatsu massage system has a deep kneading, tapping, selection. Seat vibration with three speed adjustments, motorized reclinging-forward and backword movements. Chair arms move up and down.